Registered Company Name: Germann Auktionshaus AG / Germann Auction House Ltd. The provided information made available by Germann Auction House Ltd. has been compiled with greatest care. Despite we apply strict diligence in checking, errors cannot be completely ruled out. Germann Auction House Ltd. and the author are not responsible for the correctness, accuracy, timeliness, reliability or completeness of any information. Liability claims against Germann Auction House Ltd. and the author due to material or immaterial nature, arising from access to, use or non-use of the information published through misuse of the connection or technical faults are null and void. All offers are non-binding. 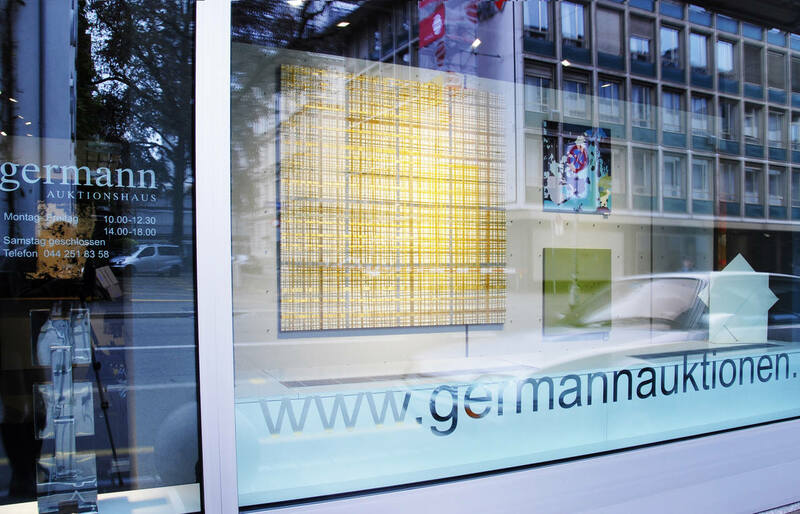 Germann Auction House Ltd. reserves the right to change pages or parts thereof without prior announcement or to supplement or delete the publication temporarily or permanently. The copyright and any other rights relating to texts, illustrations, photos or any other files on the site are the exclusive property of the company Germann Auction House Ltd. or the mentioned owners. Reproduction requires the written permission of the copyright holder and must be obtained in advance. Privacy Notice Germann Auctionhouse Ltd. The use of our web page is generally possible without providing personal data. When personal data (for example name, address or email addresses) are collected on our page, this takes place, as far as possible, always on voluntary basis. This data will not be passed on to third parties without your explicit consent. Based on Article 13 of the Swiss Federal Constitution and the federal data protection regulations (Data Protection Act, DSG), every person is entitled to privacy protection and protection against misuse of his or her personal data. We comply with these regulations. Personal data will be treated strictly confidential and will not be sold or passed on to third parties without your explicit consent. We store your data only as long as it is necessary to process the business relationship or your request. Personal data will be deleted or blocked as soon as the purpose of storage ceases to apply. Furthermore, data may be stored if this has been provided for by legislator. The data will also be blocked or deleted if a storage period prescribed by law expires, unless further storage of the data for the conclusion or fulfilment of a contract is necessary. Automatic decision making or «profiling» does not take place. In close cooperation with our hosting providers, we try to protect the databases from unauthorized access, loss, misuse or falsification. When accessing our web pages, the following data is stored in log files: IP address, date, time, browser query and general information about the operating system or browser. This usage data forms the basis for statistical, anonymous evaluations so that trends can be identified and used to improve our offers accordingly. These data cannot be assigned to specific persons. These data are not combined with other data sources. Temporary storage of the IP address is necessary to ensure the functionality of the website. In addition, the data serves us to optimize the website and to ensure the security of our information technology systems. These purposes also constitute our legitimate interest in data processing in accordance with Art. 6 (1) f) GDPR. The data collected are used for 90 days and then deleted. You can visit our site without giving any personal information. We only store access data without personal reference, such as the name of your Internet service provider, the page from which you visit us or the name of the requested file. We will use this data exclusively to improve our offer and do not allow any conclusions to be drawn about your person. The contact form on our page can only be used if you provide personal data. We limit ourselves to the most necessary information that we need for processing. We treat your personal data in accordance with the applicable data protection law. This means that we will use personal data carefully and exclusively for the purposes indicated. The data will be transmitted to us by e-mail. American third-party services such as f.e. Sparkpost or Gmail are used for this purpose. When we work with American IT suppliers, we ensure that they are subject to the US Privacy Shield. In principle, we neither disclose your data to third parties nor do we make it accessible to third parties. Our website includes functions (plugins) from third-party providers of social media platforms (e.g. Facebook). When retrieving a web page on which plug-ins from such third parties are placed, these plug-ins can automatically transfer data to the third parties. If the visitor is logged in to a third party network at the same time, the visit to the website can be assigned to his network account. We have no influence on the way in which data is transmitted. Your personal data will be transmitted securely by encryption. We use SSL (Secure Socket Layer). Cookies serve to make our website more user-friendly, effective and secure. Cookies do not cause any damage to your computer and do not contain any viruses. A cookie is a small text file that is saved on your computer when you visit a website. This textfile saves information which can be read by the website when you visit the same website again later on. Some cookies are required to keep some websites fully functional. Other cookies are useful for the user: you save your username just as securely as say your language settings. Cookies help you so that you don't need to enter the same information every time you visit a website again. Most of the cookies we use are so-called «session cookies». They are automatically deleted at the end of your visit. Other cookies remain stored on your device until you delete them. These cookies enable us to recognize your browser the next time you visit our website. You can set your browser so that you are informed about the setting of cookies and only allow cookies in individual cases, exclude the acceptance of cookies for certain cases or generally and activate the automatic deletion of cookies when closing the browser. When cookies are deactivated, the functionality of this website may be limited. Our legitimate interest in the processing of your personal data by cookies lies in the functionality and attractiveness of our website. The legal basis for such processing is Art. 6 (1) f) GDPR. You can easily change your browser settings to disable all cookies. Please beware: If you disable cookies, your username and password will no longer be saved for the website and you may not be able to use some websites' full funcitonality. 1. Click the menu button and chose «Preferences». 2. Select the «Privacy and Security» panel and go to the «History» section. 3. In the drop-down menu «Firefox will», choose «Use custom settings for history». 4. Uncheck «Accept cookies from websites» to disable them. 1. Open Internet Explorer. 2. Click on «Extras» and then on «Internet options». 3. Click on «Security». 4. You can now uncheck «Cookies» and save your settings. 1. Open Google Chrome. 2. Chose «Settings». 3. Click on «Advanced». 4. Under «Privacy and Security», click on «Content Settings ...». 5. Under «Cookies» you can now deactive them and save your settings. 1. Open Safari. 2. Chose «Settings» on your toolbar (grey cog in the top right corner) and click on «Privacy». 3. Under «Accept Cookies» you can specify if and when Safari should accept cookies from websites. For more information you can press the help button (?). We will only send newsletters, e-mails and other electronic notifications containing information (hereinafter "newsletters") with the consent of the recipients (Art. 6 (1) a) GDPR) or legal permission. If the contents of a newsletter are specifically described within the scope of a registration, they are decisive for the consent of the users. In addition, our newsletters contain information about upcoming events of our company. The registration for our newsletter takes place in a so-called «double opt-in procedure». This means that after registration you will receive an e-mail asking you to confirm your registration. This confirmation is necessary so that nobody can log in with other e-mail addresses.Subscriptions to the newsletter are logged in order to be able to prove the registration process in accordance with legal requirements. This includes the storage of the time of registration and confirmation as well as the IP address. You can cancel the receipt of our newsletter at any time, i.e. revoke your consent. At the same time your consents to its dispatch via MailChimp and the statistical analyses expire. A separate cancellation of the dispatch via MailChimp or the statistical evaluation is unfortunately not possible. You will find a link to cancel the newsletter at the end of each newsletter. The newsletter is sent via «MailChimp», a newsletter distribution platform of the US provider Rocket Science Group, LLC, 675 Ponce De Leon Ave NE #5000, Atlanta, GA 30308, USA. Your e-mail addresses and other data collected in the newsletter (e.g. browser and system information, your IP address, time of retrieval) are stored on the servers of MailChimp in the USA. MailChimp uses this information to send and evaluate the newsletter on our behalf. Furthermore, MailChimp can use this data according to its own information to optimize or improve its own services, e.g. to technically optimize the sending and presentation of the newsletter or for economic purposes, in order to determine which countries the recipients are from. However, MailChimp does not use the data of our newsletter recipients to write them down or pass them on to third parties. We maintain online presences within social networks and platforms in order to communicate with active customers, interested parties and users and to inform them about our activities. When accessing the respective networks and platforms, the terms and conditions of the respective operators apply. Please refer to their data protection information for rights and setting options for the protection of your privacy here. In accordance with the Federal Data Protection Act (DSG), you have the right to free information about your stored data (Art. 8 DSG) and the right to correction (Art. 5 para. 2 DSG). Requests for information may also be submitted in electronic form to the competent authority. In addition, you can also request that your data be deleted if it is no longer required for the execution of the contract and also request that your data be blocked. If you have any questions regarding the collection and processing of your personal data or questions regarding information and correction, please contact margrith.harder@germannauktionen.ch. Our website contains links to other websites. Germann Auctionhouse Ltd. has no control over whether the operators of these websites follow data protection regulations. Germann Auctionhuse assumes no liability or responsibility for any third-party content that may be accessed through the Website. Germann Auctionhouse Ltd. retains the right to modify the contents of this Privacy Notice at any time and without notification. The updated Privacy Notice takes effect at the moment of its publication. We therefore recommend that you consult our Privacy Notice regularly. By using this website you consent to the processing of the data collected about you and the aforementioned method of data processing as well as the stated purpose. Should a provision of this Privacy Notice become or be invalid, does this not affect the validity of the remaining provisions. In place of the invalid provision the relevant statutory provisions shall apply.